Ellen Easton shares with us her Springtime Celebration Luncheon menu, including recipes and photos of place settings. 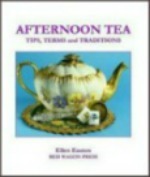 A lovely three course meal featuring a soup entree, fish entree and finishing off with desserts and tea. Hosting a luncheon is a great excuse to get dressed up and have friends over for delightful conversation and catch up on the latest news and happenings. This Springtime Celebration luncheon menu features foods and colors that welcome in early spring where the weather can still be a little wet and chilly yet signs of greenery and flowers are starting to peek out all around us. 64 pages, 21 color photos. A complete holiday menu includes 25 easy to prepare recipes; theme teas, decorating and gift ideas; invitation template and secret sources.